Saffron Strand, Inc. announces the celebration of Anton Salon’s 2nd Anniversary with a fundraiser to help the Bay Area’s homeless get off the streets and back to work. Renowned fashion designer, Joe Escobedo, who owns Anton Salon and who is Vice-Chair of Saffron Strand is applying his creative talent and fashion expertise to fundraising for the Richmond-based non-profit and its unique program to help its homeless members re-enter the workforce for the long term. The Art of Fashion features designer collections from The Glam Box Designs in collaboration with famed local designer, Belle Neptune. In addition to fashion, the fundraiser offers wine tasting, hors d’ oeuvres, silent auction, and raffles to help support Saffron Strand, which is celebrating seven years of service to the Bay Area’s most vulnerable people. 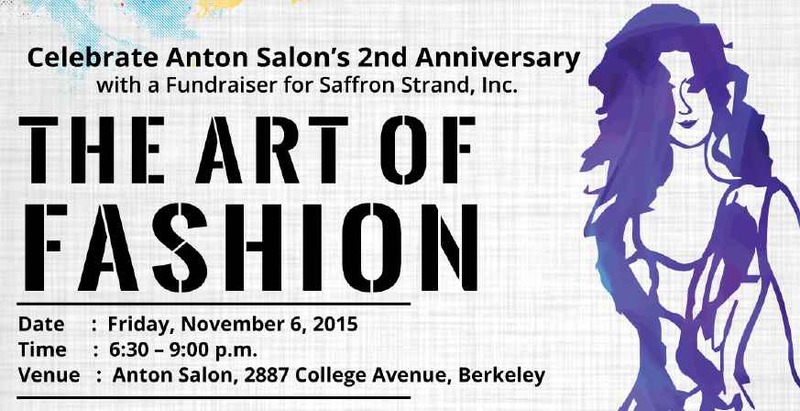 Save the date for Friday, November 6, 2015 (6:30 – 9:00 p.m.) at Anton Salon, 2887 College Avenue, Berkeley. Sponsors include Anton Salon, The Glam Box Designs, Belle Neptune, ONLY1KADER, and Saffron Strand. All proceeds go to support the work of Saffron Strand – the all-volunteer, 501(c)(3) non-profit organization whose mission is to get homeless people off the streets and back to work. Click here for Save the Date flyer!